The Peggy Guggenheim Collection is an art gallery and museum which is located inside her former home alongside Venice’s Grand Canal. Don’t be deceived by how small the building looks from the canal, because it’s actually much larger and extends to a large area at the rear including a lovely garden. It’s a really nice place to visit to get away from the heat and the crowds of Venice and it houses her personal collection of modern art. Inside, there are lots of works belonging to Peggy Guggenheim but you’ll also find temporary exhibitions too. You simply wander from room to room inside the house and it does feel like a gallery now rather than a home. For us, the highlight was the sculpture garden where you walk amongst trees, shrubs and very valuable works of sculpture! Perhaps the most famous is Marini’s “Angel of the City” which depicts an aroused man on horse back, but you will also see sculptures by Henry Moore, Giacometti, Gilardi, Goldsworthy, Holzer and Minguzzi amongst others. Peggy Guggenheim died in 1979 and her grave is in the garden too. We really enjoyed our trip here and the gardens outside were peaceful and spacious which is unusual for Venice. You also get a great view of the Grand Canal from the veranda, so don’t miss the opportunity to stand out there and watch the bustling canal. 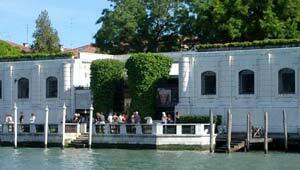 The Peggy Guggenheim Collection is open daily from 10am to 6pm. Adult admission is 12 Euros (2012 prices). The museum is located at 704 Dorsoduro and there is a Vaporetto stop on the Grand Canal nearby.